The Art of pool tables and dining tables combined. 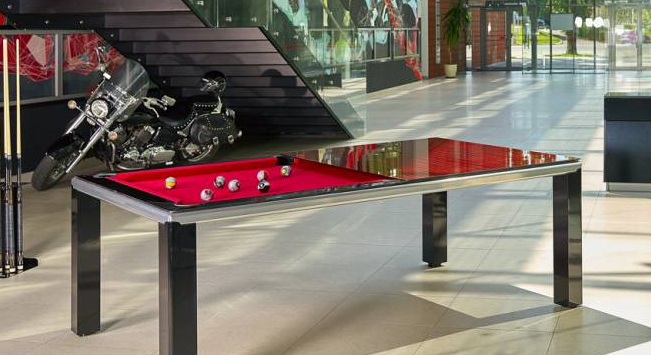 ​​Buying a pool table can be a big decision. Here is a summary of answers to some common questions we often receive, to help you better understand our tables and us, so you can make your decision with confidence and soon have the perfect table to be playing on and gathering around! 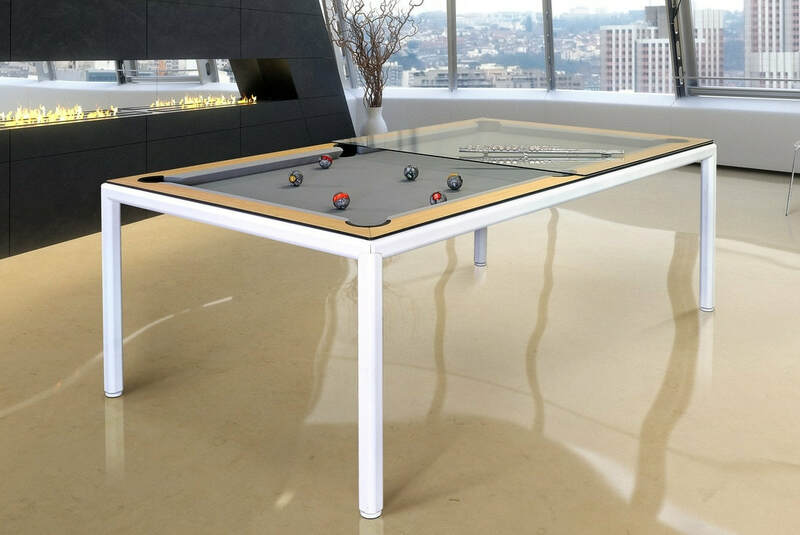 Chic Pool offers 4 fabulous collections of pool tables. The Volume Collection is bold and and beefier body than its slimmer counter part the stunning slim Chic Collection. Then there is the latest line and most simplistic and thinnest we offer, the Simply Collection. And lastly our 4th line, its the Neon Collection, which by it's name is obviously our pool table with an exciting array of neon lights and a crazy fun remote control. Oh and choosing a different felt color will never slow down your order with us. Sometimes customers stop in or give us a call and know exactly what they want, size and color of table and felt and immediately are ready to place an order. Others need a little help choosing what will work best for them and that is perfectly fine, we love helping home owners and designers, or office managers do just that. 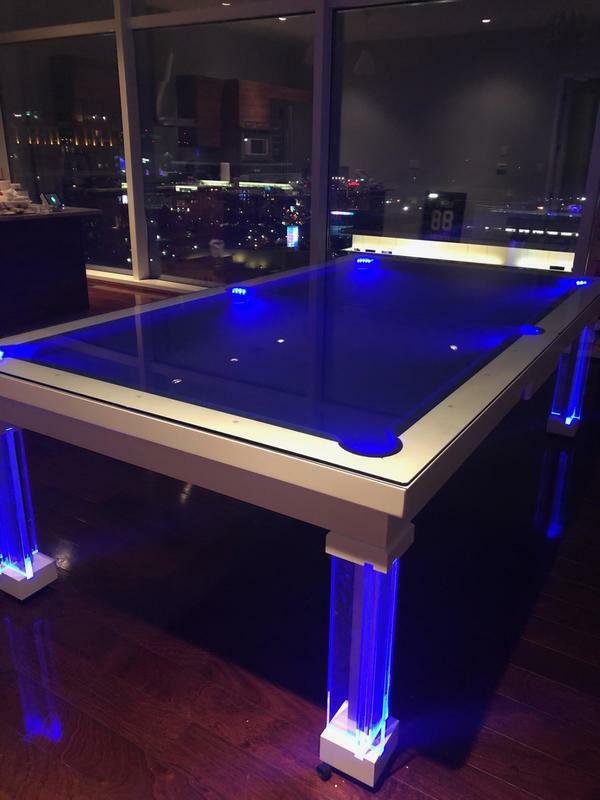 A convertible pool table is a table that has two functions, firstly it is most frequently used as a dining table that converts into a pool table. Many customers also buy our tables for office desks, conference tables, and showcase table. Our tables are built with amazing accuracy for comfortable dining and regulation playing height, and to accommodate standard sized chairs and benches. 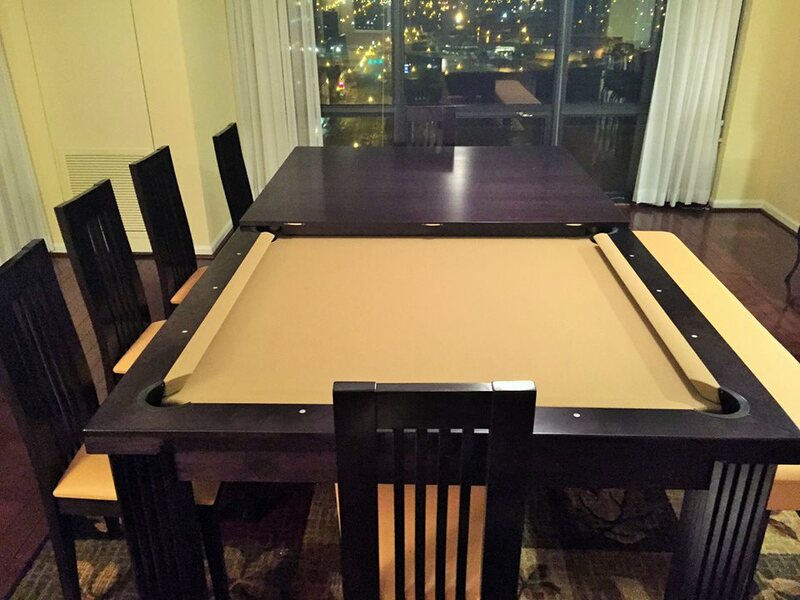 Our convertible tables are primarily used in dining rooms and recreation rooms. Thin Luxury Pool Dining Table... the "Simply"
The perfect statement for your luxury living and billiard entertaining space. Custom dining pool table in Texas. Please contact to see if we have the table you want in stock. We stock many pool tables so please contact us to find out if we have what you want. If in stock we can get it ready to ship and picked up by freight typically in just a few business days. If the pool table you want is not in stock we will give you a good idea of how long it would take to build, many times we might have a table just like your want already in the works and therefore ready sooner. Due to the one of a kind distinct hand craftsmanship put into each and every pool table please have patience and possibly expect about 2-3 months for your table to be made. ​We believe in no expense spared to yield a product that will last for generations... only precision craftsmanship and industry standard materials; slate, hardwoods, steel, pockets, rails, and professional cloth allowed. We will notify you when your table is ready to be shipped. Setup by one of our professional installers in or near your area can usually be done the next day after delivery or within a few days after delivery. Tentative set up date will be scheduled between you and the installer for your convenience. Please let us know if there is not access for an 30' semi truck to get near your home, in which case other arrangements would need to be made for delivery..... like a smaller vehicle usually at a nominal cost. 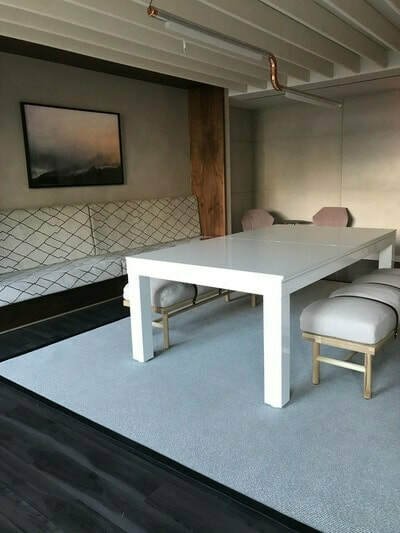 Sometimes it works that if we have an installer in your area that we have used in the past, we can ship the table to them and they can bring the table to you the day of setup, and eliminate your receiving of the table from the freight company. Each table comes on a pallet with approximately 12 pieces to be individually carried into your house or garage. We will send you a text or email of the installer contact info and a picture of your pallet so you know what to receive and also a packing slip of all the items that will be coming to you, that way you will know what to expect the day of delivery. We have professional pool table installers in all 50 states. Install usually takes about 2-3 hours and will be done by a professional BCA certified installer. Once the table is set up we appreciate any photos you would send us to show the beauty of your pool table and dining billiards room.... we just love seeing those photos. We hope this all helps in your search for the perfect convertible pool table for your living and entertaining space. And we are always here to help you thru the process and answer any questions that you may have. Our luxurious pool tables are a great way to bring loved ones together to hangout for years of fun. Add a bespoke precision dining top to convert it in seconds for dinner. I fell in love with billiard tables nearly 45 years ago playing pool with my family at home and sitting around the dinner table and hearing my dad talking about the dream of owning a billiards store in Lincoln, NE. It was just natural for me to want to be in the billiards business... I love it!